We examined the effect of cyclooxygenase (COX) inhibitors on dextran sulfate sodium (DSS)-induced ulcerative colitis in rats and investigated the role of COX isozymes in the pathogenesis of this model. 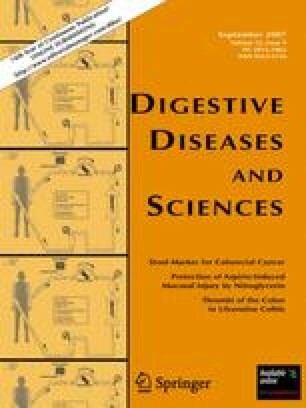 Experimental colitis was induced by treatment with 2.5% DSS in drinking water for 6 days. Indomethacin (a nonselective COX inhibitor), SC-560 (a selective COX-1 inhibitor), or celecoxib (a selective COX-2 inhibitor) was given PO twice daily for 6 days, during the first 3 or last 3 days of the experimental period. Daily treatment with 2.5% DSS for 6 days caused damage to the colon, with a decrease in body weight gain and colon length as well as an increase of myeloperoxidase (MPO) activity. All COX inhibitors given for 6 days significantly worsened the severity of DSS-induced colonic damage with increased MPO activity. The aggravation was also observed by SC-560 given for the first 3 days or by celecoxib given for the last 3 days. The expression of COX-2 mRNA in the colon was upregulated on day 3 during DSS treatment, with significant increase of prostaglandin E2 PGE2 production. The PGE2 content on day 3 during DSS treatment was inhibited by both indomethacin and SC-560, but not by celecoxib; on day 6 it was suppressed by both indomethacin and celecoxib, but not SC-560. These results suggest that endogenous prostaglandins (PGs) afford protection against colonic ulceration, yet the COX isozyme responsible for the production of PGs differs depending on the stage of ulceration; COX-1 in the early stage and COX-2 in the late stage. This research was supported in part by the Open Research Program of the Ministry of Education, Culture, Sports, Science and Technology of Japan.